1942 –Today is sure sun shiny. Marie & Dad working. got letter from Bud He sent 25.00 Marie went To show Tonight. 1943 –Left Pismo at 8 oclock Took Billy through Greenfield got To Lenards at 1.00 oclock. Edgars funeral at 2 oclock. flowers & military funeral. Sad & very nice. 1945 – I ironed today got it all Done. Dad got ride with Ray home They are sending a rig To Los Alamos. Marie came by & went into town. 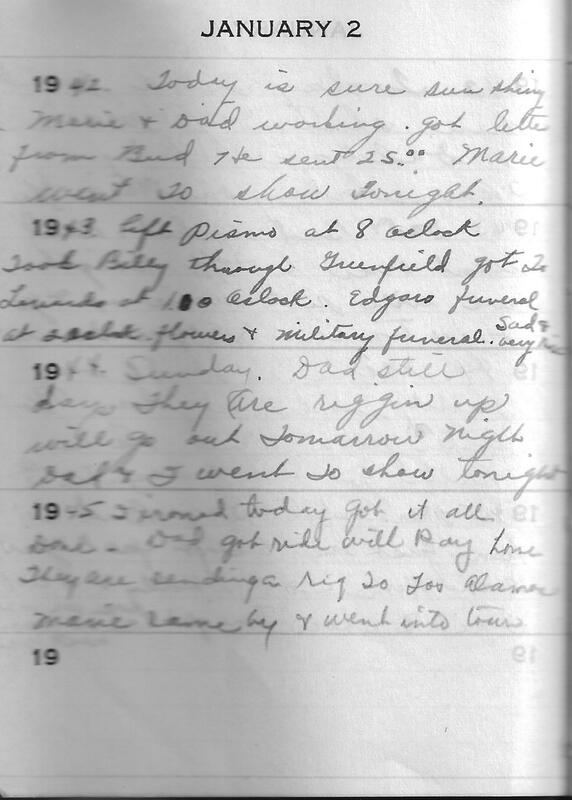 Grama indicated in her 1943 entry that they “took Billy through Greenfield” on their way to the funeral in Taft. A quick check of Mapquest shows that the drive to Taft is 99 miles. Greenfield is not on the way. The drive to Taft through Greenfield is 165 miles which make it quite a bit out of their way. It is a 3 hour drive today, a lot longer then. I wonder who Billy was and why they needed to take him to Greenfield. It looks like they just made it in time for the funeral. This entry was posted in Tennant and tagged Family history, genealogy, Greenfield California, Los Alamos California, Martha Marie Tennant, Martha Marie Wright, Martha Marie Wright Tennant, Martha Tennant, Pismo California, Rene Baron, Sylvia Rene Stevens. Bookmark the permalink.